By: Erik Hyrkas on July 7, 2017. The Samsung Galaxy S8 is one of the most stunning handheld devices around this summer. And although Samsung has taken a hit in the news lately for fraud and “batterygate” with the Note 7, we gave this beauty a full review with some astounding results. For the full details, read on below. The design of this device is as similar as it can get to the S7 Edge without calling it that. The 5.8″ Super AMOLED is as tall as can be, yet the phone is thinner in every way compared to previous Galaxy models. 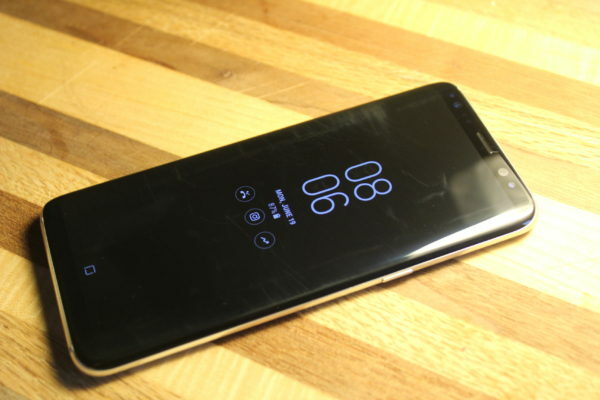 The screen bezels are almost non-existent as they curve around the edges of both sides of the device, almost exactly like the Edge. That vibrant display has 2960 x 1440 resolution with 570 pixels per inch. Our review unit was “Arctic Silver,” and it’s so shiny, you can blind jealous passersby a block away. If nothing, this is great for Morse code. The S8 has no camera bump, with a nice flush lens on the 12 megapixel camera, located between a fingerprint reader and heart rate monitor. At the bottom of the device, there’s USB-C charging, a wonderful head phone jack, and speaker. The S8 fits perfectly in the hand, and it comes with Samsung’s useful always-on display showing the time and general notifications. 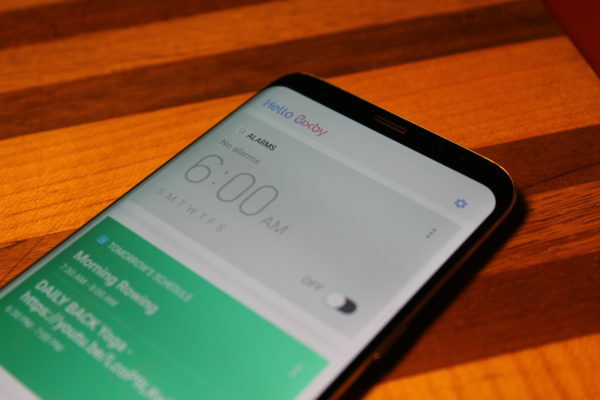 On the left side of the device, you’ll find the volume rocker and something new–a dedicated button for Bixby, Samsung’s personal assistant software. 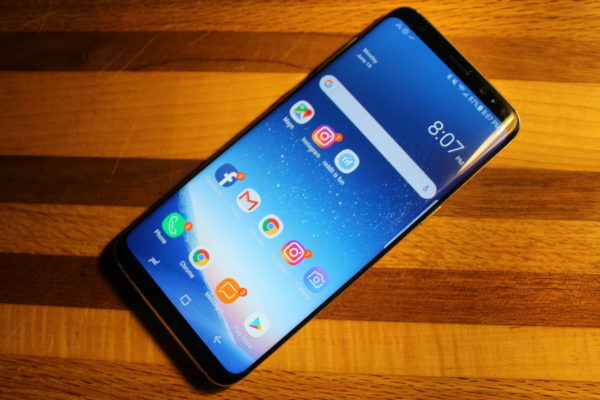 For internal specs, the S8 comes with a Qualcomm Snapdragon 835, an Adreno 540 GPU, 64GB of internal storage, 4GB of memory, and a 3,000 mAh battery. There’s also a slot for a microSD card offering up to 256GB of external storage. Gorilla Glass 5 is on both the front and back. As for those cameras the rear is 16 megapixels with optical image stabilization, 8x zoom, and the ability to save in RAW. It’s a very slick and quick shooter, and is absolutely effortless to use. Standard shooting modes include auto, pro, panorama, selective focus, slow motion, hyperlapse, and even food (tasty). There’s also the ability to take a virtual shot for 360 degree photos. In Samsung’s own app marketplace you can also download other options for shooting modes and filters. The 8-megapixel selfie camera is just as fun to use, offering average features but something you might recognize, specifically from Snapchat and Facebook–animated filters. I particularly liked the chef and animal filters. It was great fun at parties. You can see more of this documented in our video review below. 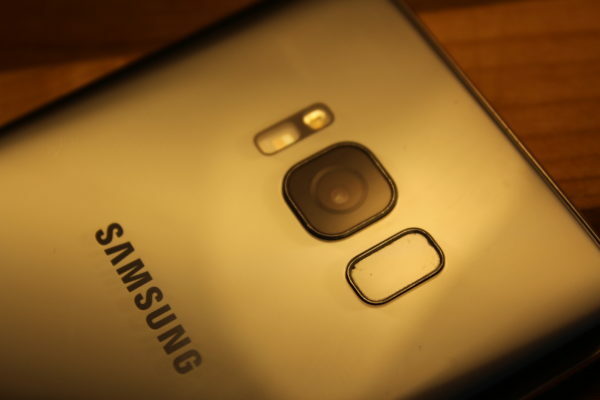 In addition, like most Samsung devices, you can double tap a button to launch the camera. In this case, it’s the power button on the right. A little different, but at least the feature is still there. Overall, shooting with the S8 is a wonderful experience. Honestly, it’s not much different than with S7 Edge. Photos are crisp vibrant, and slightly over-saturated for that nice burst of color we all long for. It’s hard to say whether it trumps the Pixel, but it definitely leaves LG’s G6 in the dust on consistency. Clouds and horizon shots were some of my favorite to take. You can also film in 4k at 30fps, which is a necessity as a flagship in 2017. The most remarkable change to the S8 is the removal of the tactile, rectangle-shaped home button and back/multitask keys that were on every Galaxy before it. Instead, Samsung included capacitive buttons (FINALLY). The home button works much like the iPhone 7’s. It allows you to click (on screen) with a simulated button press. Basically, when you press harder on the on-screen “home button,” the phone vibrates, simulating a tactile click. It’s clever, but definitely feels less tangible and satisfying compared to Apple’s version. As for the OS, Android 7.0 Nougat is quite nice on the S8. I especially loved the app launcher’s ability to open with a quick swipe up or down on the screen. It’s absolutely lag-less and fantastic. The notification menu is wonderful too, specifically with the addition of the blue light filter for late-night use (so you can fall asleep). Also, Nougat’s new battery saver mode adds a bit of customization, as it notifies you in real time how much additional longevity you can gain based on settings. 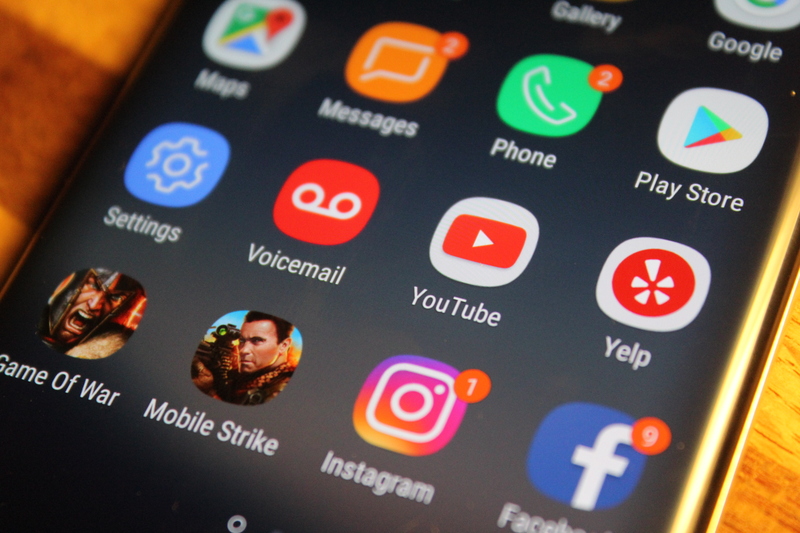 Games are fun, watching YouTube and Netflix is beautiful on the display, and typing using swype is a breeze, although we do recommend using Google’s own keyboard from Google Play store. Of course, there’s one other thing to consider with an Android phone. What’s Google’s latest OS without Google Assistant? Thankfully, despite the inclusion of Bixby, Google Assistant is alive and well on the S8 to answer your queries and play games with you. And yes, about Bixby. What of it? Samsung clearly wanted to brand its own assistant like Microsoft, Google, and Apple. However, Bixby did not have a voice assistant during this review, so the software remained a basic Google Now rip-off. While that might seem redundant, it’s not to say that it’s useless. However, the fact Samsung added a dedicated button for the tool (left side), one you can’t even reprogram without rooting, is probably the one offensive thing about the S8. I’m definitely throwing you gimmick shade for that one, Samsung. As for the rest of the software, fingerprint gestures, palm swipe screenshots, one-handed mode and the quick launch of the camera, are all included. Fingerprint gestures are also a bit of a gimmick, but the rest of these features were wonderful on the S6 in 2015 and continue to please. And so are the extra Edge swiping features that have continued on from the S7 Edge. The 5.8″ AMOLED on the S8 is incredible. And the loud speaker works even better than the Galaxy models before it. There’s one other new feature I’m in love with while also feeling somewhat terrified of. It’s Samsung’s new iris scanning software. That’s right, who needs standard finger printing and facial recognition biometrics, when Samsung can just collect data from your pupils? What’s astounding is how quick and accurate this technology is, even in low light. Samsung takes one photo of your eyes to set it up. Secondary security is added by default, like a pin or pattern code. Then, you can even customize the home screen with a backdrop for your eyes. 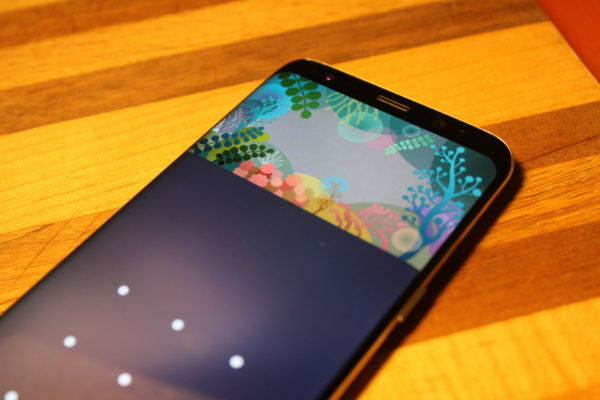 In our review experience, one quick look at your phone’s sensor unlocks the device much more reliably than the awkward fingerprint reader on the back. Fortunately, Samsung will delete your eyes and other security options if you decide the feature is too invasive, although I’m still skeptical on the future of Big Brother. I absolutely loved the Samsung Galaxy S8. It worked just great on Verizon in D.C. for phone calls, uploading to Google Drive, and texting, and the battery lasted a day and a half on most occasions. Also, the smartphone photography just can’t be beat on this device. Android Nougat is fast and simplistic, and Samsung’s minor TouchWiz skinning with the “always-on display” is incredibly helpful for checking for the time, missed calls, emails, and other items in meetings. As for gripes? Aside from Samsung forcing Bixby on users, it’s the incredibly slippery, glossy design. Fingerprints get all over it, and I was constantly wiping it down. Also, it’s so slippery, I’d most definitely buy a skin or case for the S8 so I wouldn’t fear dropping it all the time. And, as noted, the antiquated Edge features, while innovative, are something I personally didn’t find useful for me at all. After all, I have a home screen full of apps and shortcuts in the notification swipe down. The Samsung Galaxy S8 is arguably the fastest, most attractive, and future-proof device you can buy right now, and we’d recommend it to anyone who doesn’t mind a really glossy, tall phone. You can pick one up a Samsung Galaxy S8 yourself for $756 at Verizon and even lower at other locations. Last updated by Erik Hyrkas at July 7, 2017 .